Turns out one user had deleted his account in the interim. 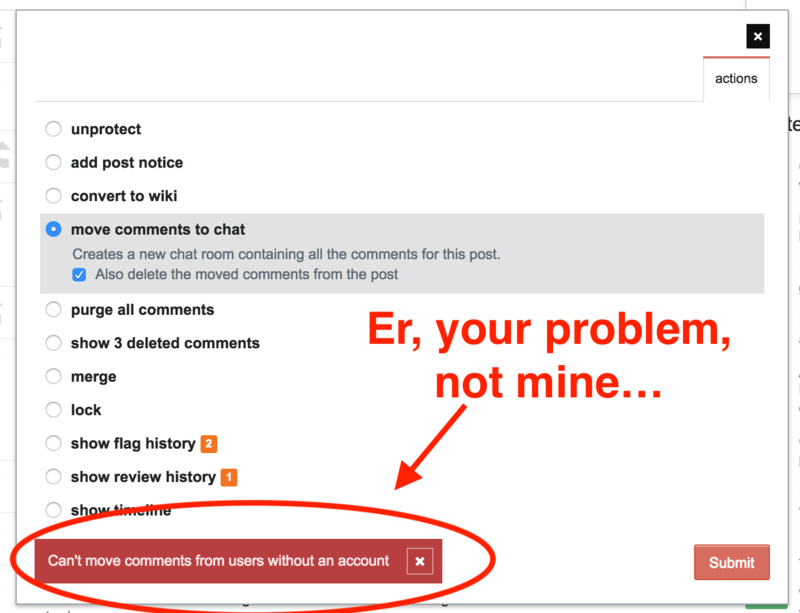 Issue is, hell if I care that you can't move comments without an account... deal with that on the backend! All I'm going to do is delete the offending comment and try again. This should be handled transparently. The problem with just handling it on the backend is that not all situations should be handled automatically - some really do need the moderator's eyes to make sure this is still a good thing to do. Consider a situation where a moderator doesn't realize that comments from a deleted user cannot be migrated, tries to migrate a conversation between only two users, and ends up losing half the conversation and creates a chat room of one user talking to themselves. We definitely should stop that scenario. That may be an extreme example, but there's plenty of room in between. The bottom line is we'd rather moderators look though and explicitly delete the comments and evaluate whether the conversation is still worth migrating to chat without those comments present. Does the conversation still make sense? Does losing this comment require deleting some other comments that reference it? Would it make more sense to just purge the comments on this post? Those decisions are better left to the moderator, not an automated process. Consider the same situation above - a conversation between two users, one deleted. Why exactly are we migrating that conversation in the first place? If one of the users is deleted, then the conversation is basically dead. If there is no value in keeping the comments under the post, then there is certainly no value in preserving them indefinitely in a chat room. The point of migrating to chat is to give users an alternate place to continue a discussion they're having, not to preserve an already-dead conversation somewhere else. This is again a decision that a human needs to consider. Perhaps if there's a really good case for keeping comments by deleted users, we could think about some sort of override, but it would still involve seeing a warning first so that the moderator could reevaluate their decision. Not the answer you're looking for? Browse other questions tagged bug comments moderator-tools deleted-accounts .